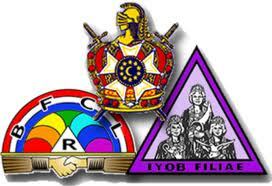 While there are several youth organizations sponsored or supported by the various Masonic organizations, three are the largest and best known. The Order of DeMolay is an organization for young men aged 12 to 21. Young men do not need to have a Masonic relative to join the organization. DeMolay was founded in Kansas City, Missouri, in 1919, and is now international in scope. Like the other Masonic Youth Orders, DeMolay Chapters (local groups) usually meet in a room at a local Masonic Lodge. Adult leadership is provided by men (usually Masons) known as Chapter Dads or advisors. The Order takes its name from Jacques DeMolay, the last Grand Master of the Templars, who was martyred in the Middle Ages for refusing to compromise his honor. The Order teaches the virtues of reverence, love of parents, comradeship, patriotism, courtesy, cleanness, and fidelity. The Order provides many social events and activities, which help to teach social skills and leadership. The International Order of Job’s Daughters takes its name from a story in the Biblical Book of Job. It was organized in Omaha, Nebraska, in 1920. Membership requires the young woman be related to a Mason. The local organization is called a Bethel. The teachings of the Order are Biblically based, and similar virtues are stressed as in the other Masonic Youth Orders. Job’s Daughters places special emphasis on community service. Many Bethels work with drug education programs and with the Hearing Impaired Kids Endowment (HIKE) Program. Membership is for young women age 10 to 20. Masonic Service Association of North America WebsiteImages used on this document are Trademarked by the individual organizations, their use here is for informational purposes only.Harding San Juan Lodge #579 promotes and supports our local Masonic youth group's activities.